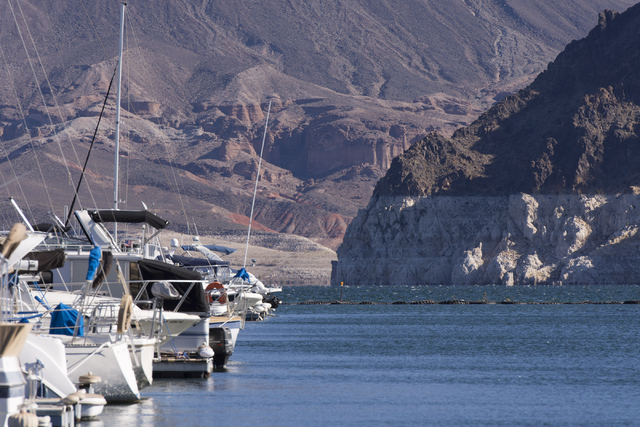 With snow piling up in the mountains that feed the Colorado River, the short-term outlook for Lake Mead has suddenly improved. Jason Ogulnik/Las Vegas Review-Journal The "bathtub ring" from declining water levels at Lake Mead can easily be seen at the national recreation area in mid-November. Heavy, early snowfall in the mountains the feed the Colorado River will boost the water level this year and avoid a declaration of the first federal shortage. Jason Ogulnik/Las Vegas Review-Journal The shrinking water level at Lake Mead can be seen near the Lake Mead Marina on Nov. 17, 2016. Heavy and early winter snow will likely ease the shortage and stop levels from declining further. But new research warns of more trouble ahead. First the good news: Federal forecasters now expect the reservoir to avoid its first federal shortage declaration next year, thanks to the boost it should get from what could wind up as the wettest winter on the river’s basin in 20 years. “We’re in for a good year, no doubt about it,” said Randy Julander, snow survey supervisor for the U.S. Department of Agriculture’s Natural Resources Conservation Service in Salt Lake City. Storms in Utah, Colorado and Wyoming over the past month have added more than 3 million acre-feet to the water supply forecast for the Colorado. That’s a 10-year supply for Nevada, which gets 300,000 acre-feet from the river each year. 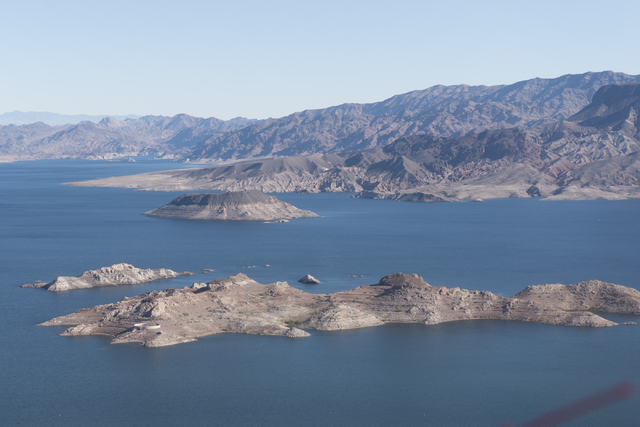 The latest forecast from the National Weather Service’s Colorado Basin River Forecast Center calls for the surface of Lake Mead to start 2018 about 3 feet above the trigger line for a shortage declaration that would force Nevada and Arizona to reduce their river use. Projections in January called for slightly below average flows on the Colorado through this summer, resulting in an 11-foot drop that would take the lake below the shortage line. Forecasters now expect 9.6 million acre-feet of snowmelt — 134 percent of the average for the past 30 years — to make its way into the river between April and July. One acre-foot of water is enough to supply two typical Las Vegas area homes for just over a year. The Colorado River provides water to some 40 million people in the U.S. and Mexico. Some monitoring stations on the western slope of the Rocky Mountains show roughly twice as much snow as usual for this time of year, and Julander said it is very wet and “ripe” to begin melting into the river system. Heavy snow and rain in California also could take some pressure off the overburdened Colorado. The Golden State draws more water from the river than anyone and might be able curb its use and store more of its supply in Lake Mead now that its own reservoirs are filling again following heavy rains in the lowlands and snowfall in the Sierra Nevada. Just as forecasters were upgrading their near-term projections, researchers unveiled bleak new findings in late February suggesting that climate change has already diminished the Colorado and could cut its flow in half by the end of the century. The authors of the report, Jonathan Overpeck of the University of Arizona and Bradley Udall of Colorado State University, said the river has lost at least 500,000 acre-feet of annual flow as a result of global warming over the past 17 years. The losses will only increase as temperatures continue to rise and “mega-droughts” lasting 20 years or longer become more likely, research indicates. Lake Mead was nearly full when the current drought took hold on the Colorado in 2000. Since then, the surface of the reservoir has dropped 128 feet. The research was funded by the Colorado Water Institute, National Science Foundation, the National Oceanic and Atmospheric Administration and the U.S. Geological Survey. Their findings have been accepted for publication in Water Resources Research, a journal of the American Geophysical Union.